The exterior of your home can offer real insight into the type of personality you have, as well as the lifestyle you lead. Timber has the wonderful ability to be able to infuse an air of tenacity, spirit, and character into a home that many other window and door materials simply cannot achieve. So, congratulations on choosing the most timeless home improvement material around for your High Wycombe home improvement project! You want a timber type that will last a lifetime and beyond. 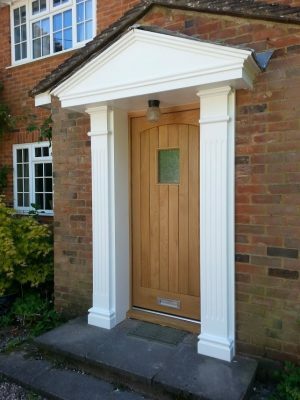 So, timber door and window materials should be chosen for strength, durability, and stability above all else. Wood is split into two main categories, hardwoods and softwoods; hardwood comes from broad leaf-bearing trees and softwood comes from needle-leaved, cone-bearing trees. These misleading terms do not mean that hardwood is harder than softwood and vice versa, as some broad leaf-bearing trees produce relatively soft wood. However, hardwoods are generally considered to be heavier and denser than softwoods. This is why hardwoods are generally used in the construction of walls, ceilings, floors, etc whilst softwoods make ideal timber doors and windows. 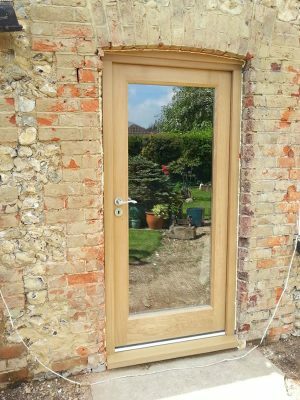 Alongside traditional soft and hardwoods, we also use Accoya wood within our timber door and window installations. Accoya is a specially treated softwood that’s able to exceed the properties of any of the best hardwoods and treated woods; with a 50-year guarantee not to rot! As one of the most sustainable building materials around, it makes exceedingly strong, durable and stable timber doors and windows – which is why it’s the world’s leading high technology long life timber option and Buckinghamshire’s favourite home improvement material. With over 50 years of bespoke timber joinery expertise to share, get in touch and we’ll be happy to advise you further on the most appropriate timber for your windows and doors to achieve the best possible finish.